The follow-up to his Man Booker Prize Winning Life of Pi, Yann Martel's 2010 Beatrice & Virgil is yet another tale in which animals stand in for humans at the height of crisis. In the shadow of Pi, but judged on the merits of its own literary construction, the novel was unfavourably received by critics and readers. It was with hope then that, given the novel's overt allusions to Samuel Beckett, an adaptation for the stage might potentially better translate the spirit of Martel's Holocaust parable. Lindsay Cochrane's efforts help unpack the nested narratives and transports us to a vision of Beckett's country road - but that's about all the new drama improves upon. The muddled nature of the original text, and its reliance on a framing device with an unlikable author in search of meaning, saddles the adaptation with the same challenges, leaving us wondering whether Beatrice & Virgil is a work deserving of more attention. Henry (Damien Atkins) is an author struggling to find his voice in the wake of great literary success (a la Martel). After publishers reject his latest offering, he takes up the clarinet and starts work in a cafe. When a fan requests Henry help him complete his play, the author is intrigued. The fan turns out to be a taxidermist (Pierre Brault) with a play called A 20th Century Shirt, about a donkey named Beatrice and a howler monkey named Virgil caught up in traumas they've dubbed 'The Horrors," for want of any phrase that could come close to describing what they've experienced. That the taxidermist's play is an allegory for the Holocaust is not a spoiler, though it somewhat feels positioned as such for the stage. In Martel's novel, Henry openly explores the question of representing the Holocaust from the outset, setting up for his readers the allegory that is to unfold. In the adaptation, Cochrane, after a brief introduction from the author, goes straight to the taxidermist's letter. 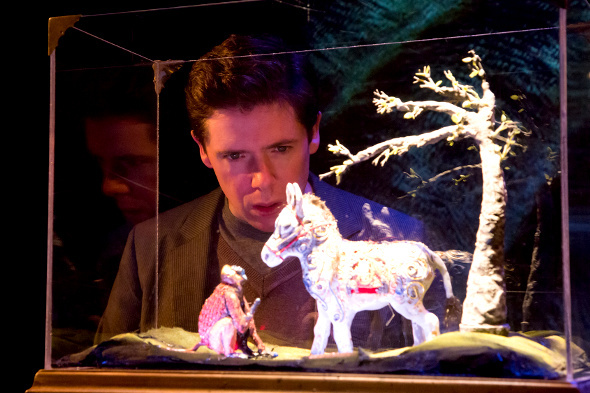 For audience members unfamiliar with the novel, the play becomes more a journey of discovery where the reality of Beatrice and Virgil's true station, and the role of the taxidermist, is unmasked when Henry pieces it all together. Though, intentionally, the allegory isn't all that hard to discern, it still feels like Cochrane builds towards this "aha" moment. The result is that something important is lost from Martel's original intent. In positioning the question of Holocaust representation early in the novel, he allows the reader to then grapple with the allegory that unfolds. Does this form of representation, with two animals as characters, bring us closer to an understanding of the horrors of the Holocaust? While the novel may not have fully engaged the question, the positioning of the debate followed by an attempt to answer allows readers to actively participate along the way. Downgrading Beatrice & Virgil to a puzzle - have I yet figured out that this is a Holocaust allegory? - reduces the thrust of Martel's efforts and allows audiences to pat themselves on the back if they catch on in ready time. While this may not have been the intent, it certainly feels like the main takeaway. Director Sarah Garton Stanley utilizes a number of interesting stage pictures to bring the allegory to life - miniature figures on a taxidermist's table, projections designed by Ken Mackenzie, and a life-size Godot-inspired tree - on a clever set from Amy Keith. The stage levels don't fare so well throughout the action, though, as those staged at the very back tend to get lost behind the layers in the forefront. Atkins and Brault do their best work when playing the title characters, understanding the Beckett-esque creatures better than they do their human counterparts. They each have a shining scene late in the action: Atkins, as Beatrice, sharing a dark and devastating chapter and Brault, as Virgil, extolling the virtues of a ripe pear. But these more memorable moments are adrift in a convoluted narrative that, while it may seem to fit a theatrical telling, doesn't rework the source material in a more interesting way. Beatrice & Virgil, written by Yann Martel, adapted by Lindsay Cochrane, and directed by Sarah Garton Stanley, runs at the Factory Theatre until May 11.